Equipoise Software produces the Kingdom Seismic Inversion module for IHS Markit Kingdom. Please contact your local IHS sales team for a trial of Seismic Inversion as part of the IHS Kingdom software package. 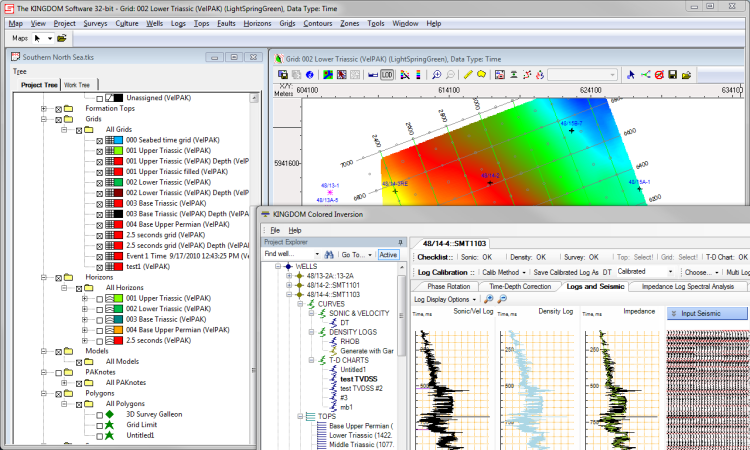 Seismic Inversion is also available as a component of the Equipoise Software InSeis package. The model parameters to be determined are the formation properties. Seismic inversion thus aims to replace boundary responses by layer properties. When the seismic reflection signals to be inverted are conventional stack traces – ideally near offset responses – the formation property of the layered model to be estimated is acoustic (P-wave) impedance. Acoustic impedance is the product of rock velocity and density – key parameters that relate to porosity, permeability and other reservoir properties. Inversion as a general procedure attempts to explain the results of a set of observations in terms of the parameters of a model for the system from which the observations have been made. The aim of seismic inversion is specifically to transform the conventional seismic reflection responses into a layered model representation that distinguishes different formations. Colored Inversion is a robust method for “quick-look” inversion, which has been shown to produce results comparable with the more involved and computationally intensive “sparse-spike” method. A matching filter is designed and the seismic traces are processed to match the coloration of the acoustic log data. Simulated Annealing (SA) Inversion is an inversion to absolute acoustic impedance. A loosely model-driven inversion, this brings high-end post-stack inversion technology to an easy to use, desktop package. Kingdom Seismic Inversion supports single and multi-well analysis. Automatic seismic to well phase correction with quality control at each stage of the inversion operation. Kingdom Seismic Inversion also features sonic log to time-depth curve and check shot calibration, with a highly customizable and user friendly interface. The inversion enhances your seismic data making it easier to interpret, increasing interpretation productivity and accuracy. Fast and robust method of generating a seismic inversion data type ideally suited for use by all interpreters. Matches seismic data to well log data to produce cleaner data with less noise and less signal instability. Neither wavelet nor low frequency macro-model is required. Simple for the interpreter to set up and use Ideal ‘quick look’ inversion tool for use prior to more detailed inversion studies.